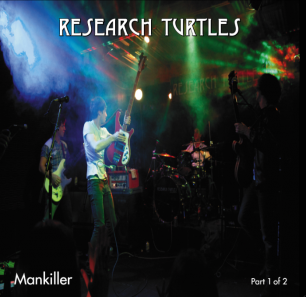 Research Turtles, hailed by critics as “the epitome of Brit Rock and Power Pop,” present Mankiller, a split release album on Normanium records. With Part 1 out in May and Part 2 due in September 2011, Mankiller follows the band’s 2009 self-titled debut which independently sold over 5,000 copies and sent Research Turtles on an extensive tour across the Gulf Coast, supporting international acts such as Toad the Wet Sprocket, Sister Hazel, and Candlebox. To top it all off, the debut album’s opening track, “Let’s Get Carried Away” was awarded 2010 “Song of the Year” by Great Britain’s RadioSix International. Based in Louisiana, Research Turtles is comprised of Jud Norman (bass, vocals), Joseph Darbonne (guitar, vocals), Logan Fontenot (guitar, vocals), and Blake Thibodeaux (drums). the sentimental trinkets. Yes, I know they actually weigh me down. It makes me sad to part with them though; somehow I feel like they are a part of me. If I toss them aside, will I be losing a piece of myself? Don’t you cry, everything will be alright. I don’t want to let go. Letting go is losing meaning. How do I set the past on the table and say thank you for all you’ve meant to me, but it’s time to let you go now? Is that not trivializing it all? Still, I feel so tired, so lagging. The future is fuzzy and the past is so clear. I want to relax my grip, yet my muscles won’t obey. I know I should release myself from what no longer works for me, move forward and purge the staleness from my life. I should, I know. There are a lot of things I know I should do. I just can’t do it if I don’t feel it. I’m an emotions driven person. It’s a fault of mine sometimes. How low do I have to get before I finally decide to change? What will be the catalyst pushing me beyond fear to freedom? What stars have to align before I truly get carried away? Research Turtles released ‘Mankiller: Part 1 of 2’ May 31, 2011. ‘Part 2’ is due in September. What song allows you to get carried away?